If you have purchased a whole piece to enjoy with your family and friends, cut your steaks according to your preferred thickness. We recommend cutting into 1/2 inch to 3/4 inch steaks. Of course, you are always welcome to cut an even thicker steak. Season your steak sparingly with some salt and pepper. 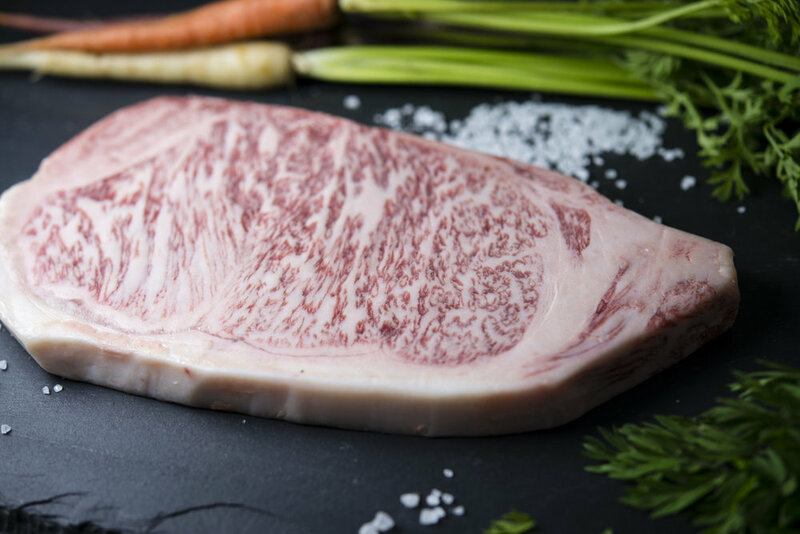 We do not want to over-season and overpower the delicious Wagyu taste. Thicker cuts of steak may need additional seasoning. (Alternatively, you can skip seasoning your steak and have some specialty salts or a light seasoned dipping sauce for a variety of flavor combinations during your eating experience). Let your seasoned steak sit out at room temperature for about an hour. The reason for this step is so you are able to cook your steak evenly to that precious medium rare. (Optional) Heat your pan on medium high with a sprinkle of neutral-flavored oil. You will not need much oil as the fat from the Wagyu will melt into the pan allowing you to cook your steak with its own juices. You can also use any trimmed fat from the Wagyu to coat your pan as it heats up. Before searing, pat your steaks dry. This will help sear your Wagyu and develop a nice brown crust. Once the pan is thoroughly heated, place your steak in the center to sear it. Depending on thickness, cook until you can see the juices on the top of the steak form and there is a nice brown crust, and then flip the steak. Please note that with all steaks, not only Wagyu, it is important that you only flip the steak once. Cook on this side, and then remove from heat. The residual heat will keep cooking your steak.